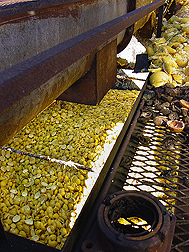 In the future, citrus peel waste like this could be used for ethanol production rather than cattle feed, its current use. The current goal is to build a 10,000-gallon operation during this year. Widmer thinks that, with further research, Florida’s citrus peel waste could yield up to 80 million gallons of ethanol per year. That amount won’t meet the nation’s demand, but it could meet a local demand for oxygenating fuel additives in central Florida. “This could be a great revenue source for citrus growers,” Widmer says.—By Alfredo Flores, Agricultural Research Service Information Staff. This research is part of Quality and Utilization of Agricultural Products, an ARS National Program (#306). Wilbur W. (Bill) Widmer is with the USDA-ARS Citrus and Subtropical Products Research Laboratory, 600 Avenue S, N.W., Winter Haven, FL 33881; phone (863) 293-4133, fax (863) 299-8678. "Ethanol Feedstock From Citrus Peel Waste" was published in the April 2006 issue of Agricultural Research magazine.